I previously posted about my new samsung n220 that I'm using for development on the go. One problem with it that's plagued me for quite a while is suspend, and more specifically, resume. 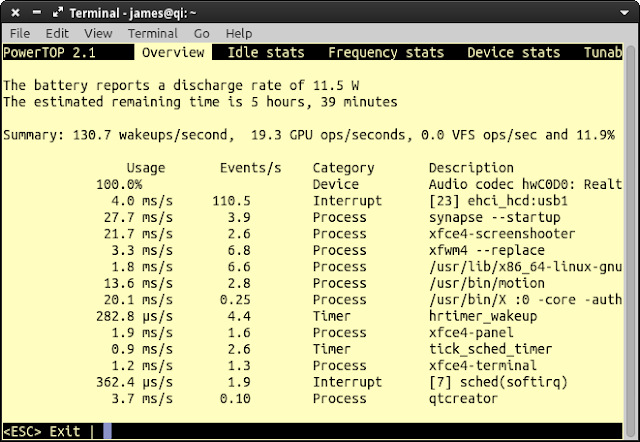 And it's hardly a consolation prize that the laptop can go to sleep so easily if it can't wake up again! The trouble was that it only periodically failed to resume, which makes it a nightmare to debug as you can never 100% trust that your latest tweaks have actually fixed the problem or not. Well, I'm posting this update to say that I'm almost maybe probably possibly definitely mostly 99% certain that I have a fix. It's not really addressing the base cause of the problem, which I suspect is a buggy ACPI BIOS, but it serves to prevent the strange failure state that it kept getting stuck in. C State. C State run. Run, state, run! Intel C States are the terms used to describe how active or sleepy the processor is at any given moment. C0 means the processor is busy working at full capacity, and higher numbers refer to increasing amounts of laziness in the name of power efficiency. A lot of the time while you are using your laptop, it really isn't doing anything special, and will sit in the lowest power state - the highest numbered C state. This isn't a problem, because under normal circumstances, it takes mere microseconds to snap back to life when needed. Unless, maybe, it goes into this deep sleep mode just as the laptop is also going into an ACPI sleep mode and maybe it's just too sleepy to wake up and just five more minutes, please. Pushing the right arrow key takes us to the Idle stats page, which shows the percentage of time spent in each state. 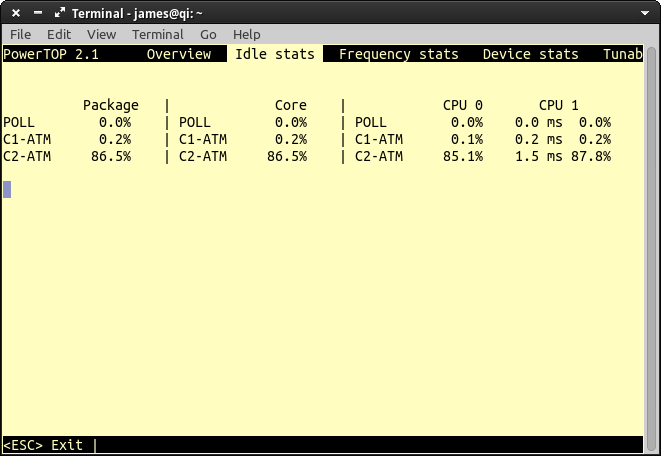 Unfortunately, it seems that that max C4 state is interacting badly with whatever ACPI bug I also have. So the fix is to simply tell Linux to never let the processor daydream that hard, and to give it a good poke if it tries to doze off. We're no longer spending any time in the C4 state. And months and months of cautious use will show that it's actually working and hasn't failed to resume once! Obviously, not entering the maximal power-saving state means slightly increased power draw on average and slightly reduced battery life. I haven't noticed a huge difference, personally; the power use tends to hover around 10W±1 and I still get more battery life from a full charge than I spend in a typical outing. I hope someone out there with similar problems finds this information useful. It's always so hard to find a good solution to these kinds of problems online, because they're always very specific to individual hardware and software configurations. What worked fine for one person may be completely useless for another; I tried blacklisting modules for various bits of possibly-buggy hardware, and tried different acpi-related kernel params. Just as I decided that I had finally found the solution, it would get locked up again. But I've finally got it sorted out and there's just one more problem to fix: The 3G modem!